This is the sesquecentennial of Tantia Topi’s hanging for what is sometimes called India’s First War of Independence. 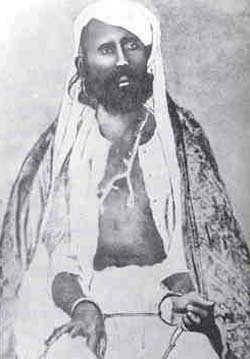 Tantia Topi — there are many variations of the name — commanded Indian troops when a mutiny mushroomed into outright revolt. Putatively in the service of a rebellious lord, Topi immediately established himself as the cause’s most capable commander. His forces bloodily seized Cawnpore (Kanpur) in a heady surprise victory during the conflict’s opening stages. A British counterattack overturned that promising development. The Indian lord was captured, but “all the capacity for resistance that he ever displayed” had been supplied by Topi. Now, Topi found a more impressive liege in Rani Lakshmibai, and deployed his genius for soldiery in a fast-evolving war — harrying the occupiers in both conventional and (increasingly) guerrilla-style combat. The rebels were outclassed; the time was not yet ripe — but Topi’s was the model of anticolonial guerrilla insurgency that would figure so prominently in the next century. Topi was taken, at last, by betrayal, and dead at the order of a drumhead military court within days. But the day after the London Times published its report of the popular hero’s hanging (“a great scramble was made by officers and others to get a lock of hair, &c”), it editorially eulogized* Topi with the gusto of victor catching, perhaps, the foreshadow of Indian resistance awaiting in generations still to come. He raised armies as fast as we could disperse them, took up one position after another to our infinite annoyance, and led us a chace which, despite of unexampled efforts on the part of our soldiers, seemed to be really endless. Our troops pursued him without intermission, contrived more than once to surprise him, repeatedly captured his artillery and scattered his troops, but could never deprive him entirely of followers or guns. He seemed to summon forces from the earth as if by magic. As the pursuit grew hotter and hotter he mounted his men on ponies and camels, and marched, it is said, at the average rate of 60 miles a-day. Wherever we found him he had always cavalry and guns, and these he posted with remarkable skill. Nothing could more forcibly illustrate the reputation which this man had acquired than the fact that his fate has been attended with some regret … if he had not met his match in those opposed to him he might have founded a dynasty. * May 21, 1859. Information moved a little slower.